Budget Continental - $4.50 per person - Muffins, bagels with cream cheese, individual flavored yogurt, assorted fruits, orange juice, milk, coffee. Traditional Breakfast - $6.00 per person - Hash browns, sausage, bacon, scrambled eggs, mini croissants, banana or zucchini bread, orange or apple juice, milk, coffee. Executive Breakfast - $7.50 per person - Hash browns, sausage, bacon, scrambled eggs, cinnamon or peach coffee cake, variety of cold cereal or yogurt, mini croissants, orange or apple juice, milk, coffee. 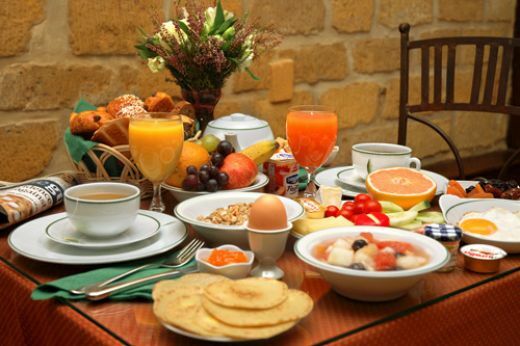 VIP Breakfast - $8.50 per person - Hash browns or potatoes o’brien, sausage, bacon, scrambled eggs, mini croissants, cinnamon or peach coffee cake, banana or zucchini bread, variety of cold cereal and yogurt, seasonal fruit, milk, orange or apple juice, coffee. Waffle Bar - $10.00 per person - Includes scrambled eggs, hash browns, sausage, milk, orange juice, maple syrup, strawberries, peaches, spiced apples, whipped cream. Omelet Bar - $10.00 per person - Includes mushrooms, peppers, tomatoes, onions, fresh salsa, olives, sausage, ham, bacon, American and Mozzarella cheeses.